This morning I saw a perplexed looking woman trying to walk her 10-week oldish puppy black labrador. It stopped to look at me as I drove slowly by (looking at it!). I knew that image of cute puppy stopping and twisting its head awkwardly on its lead would keep me in good spirits all day! As someone who has experienced the nightmare that is a puppy labrador and the 10 years of hard-earned joy that followed, I could totally relate to why the owner’s look was one of frustration and confusion. And yet we’ve all been there. Puppies, in all their bundles of cuteness, are so easy to forgive. She’ll be OK! I am not currently a dog owner and said goodbye to my best friend last year, but there is nothing like a puppy to brighten your day. 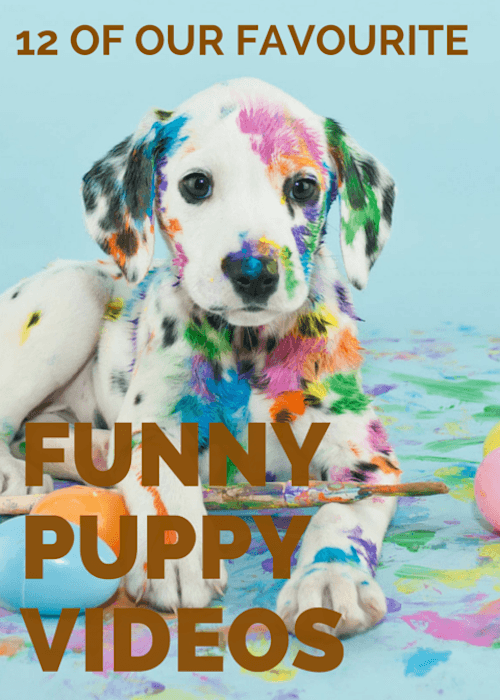 And funny puppy videos – great to share with friends online – let you experience all the joy, laughter and tears that come with puppy ownership without, well, the personal trauma! Of course, if you’re a dog owner you know that, at the end of the day, when you’re both sleepy and having a cuddle on the couch together, you know it’s worth all the hard work. So here are 12 of our favourite for you to enjoy at your leisure. Every mother’s been there! It’s nap time and her puppy just wants to play! This little bulldog pup is just not going to give up the challenge. Music to the ears! A beagle pup that doesn’t need much coaxing to do what comes naturally. Mirror mirror on the wall, who’s the silliest of them all? Seven puppies, one cat. Of course the cat’s going to win! When this puppy grows up he wants to be a human. Can’t. Stop. Laughing. I have no idea why this dog is on a treadmill, but the puppy’s pretty cute (and determined) to join in! So many options! It’s all too much! The reward of licking this baby sees this pup never, ever giving up on his quest. What a mean ball, what a mean, mean ball. This puppy is all fluffy ears. Can we all have one? One small step for dog, one giant leap for puppy! And if your puppy does something funny, be sure to capture it on video, but also don’t forget to capture it on camera! One of our gorgeous pet paw canvas collages will delight you for years to come, so gather up those photos and celebrate all the goodness of puppies! Eli is Canvas Factory's resident blogger and social media buff. She has a passion for art, craft, design, fashion and photography. She loves to explore the joys and challenges of family life, relationships, motherhood and pet ownership. Eli finds it's more funny to poke fun at herself than others. She's travelled extensively and considers herself a citizen of the world. Get the latest deals direct to your inbox! Why Use HD Metal Prints? At the Canvas Factory our mission is simple: we want to make photo to canvas printing easy and affordable for everyone. We pride ourselves on the service we offer and the quality of the materials we use. We are committed to preserving your memories as wall art, at the lowest price possible. COPYRIGHT © 2013. CANVAS FACTORY.